Where the BBQ Pros go! 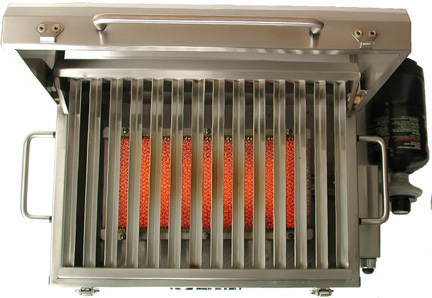 Infrared grill is a special type of burner through which infrared energy is generated by converting the heat. It concentrates the flames coming through the burner directly to the ceramic tile. An intense source of heat is generated through this technique, which is much hotter than any charcoal or traditional gas grill. It generates the heat that can go up to 700 degree F. It is the best means for grilling as foods are more evenly cooked in very less time. It is also best for certain foods that can’t be slow cooked. Moreover, meat on the outside can easily be caramelized and cooked, while keeping the flavors and juices intact. Summer is the perfect time for grilling, but you can entertain your family and friends in any time of the year through infrared grilling. It is always handy to keep the knowledge of some grilling techniques for any backyard cookout. Normally, the meats grilled on the traditional gas grills are dry as they heat the air surrounding the foods. With infrared grill, there is no need for you to worry about the moisture and flavors of the meat. Now, let’s have a look at some of the techniques to cook on infrared grills. Heat the grill for about 2-3 minutes before you put the meat on it. This will make sure the meat is thoroughly cooked. Provide heat on all sides for about 2-3 minutes. Since the preheating will make sure your food is cooked thoroughly and fast, it is necessary for the outer layer to be charred. It is necessary in order to create barrier between the heat outside and the flavors or moisture of the food. Decrease the heat once the food if properly charred. Turn the food over every 2-3 minutes while cooking. Open up the hood of the grill while cooking. This will allow the food to be heated properly. Don’t eat the food as soon as it is cooked. Let it rest for about 5 minutes. Even after being removed from the grill the food will keep cooking itself because of the extreme heat from the grill. Wait until the inner and outer temperature is even. These are the simple things a barbeque lover must know. And don’t forget to clean the grill after you have finished eating which you can do simply by turning the grill on. The heat on the grill will char away the residue. Author Bio: Scott Garcia is an experienced writer who writes on different topics. Read his recent article on culinary degree online if you want to have a career in the field of cooking. Pork, Beef, Lamb and Chicken! Whatever it is, as long as it is barbecue, many people will surely love it. Weekends couldn’t get any better than when spent with friends, loved ones and barbecue. It does not take a genius to make a great tasting home cooked barbecue; it only needs imagination, creativity and a little bit of patience. A great tasting barbecue is cooked slowly with a moderate heat within a considerable length of time. Barbecue is not like grilling which takes less cooking time since the heat temperature is much higher. The reason for such cooking method is to allow the flavors of the meat to be absorbed while making it tender. Most people exaggeratedly describe it as “falling of the bones”. A good smoker or grill is the most basic and important aspect of barbecuing. As mentioned earlier, the heat must be controlled and maintained. This is to prevent the meat from being burned outside and dry. In addition, choosing a good type of wood chips is also a factor. Since the smoky flavor that the chip gives add more appeal to your barbecue. Preparing the meat ahead of time is also important. It should be in a room temperature, and well marinated. The marinade you use is up to your own preference. It can be hot and spicy, sweet or some like it a little bit of everything. 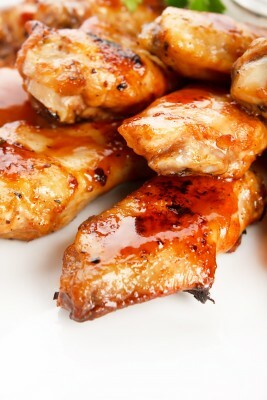 One should also remember to save the marinade, since it can be used to make your barbecue sauce. It will make the sauce better tasting because of the juices and meat flavors mixed into it. When cooking the meat, try not to get excited and flip it as you like. This will cause the juices and flavor to drip out of the meat then everything will be dry. Tasty barbecues are cooked with patience. Flipping it once to three times be okay, without pressing it. Covering the meat while cooking is also great in keeping the heat and infusing the smoky flavor into the meat. A little help from the kids is also a fantastic idea. Making the work less tiring while having some time bonding with your family. Giving the kids some easy chores or task during this weekend barbecuing activity would let them learn a thing or two about being responsible. There is also a theory of resting the meat first before cutting it. In this manner, you are allowing the juices to get back inside the meat thus making it tastier. Apart from it, you also prevent all the juices from running over the serving plate and making everything look messy. The theory is to allow the meat fibers have some time to relax and take in the flavors after removing from the intensity of the heat. Eat and serve with love. This way, all the family members will enjoy the food and remember the good things of the activity. Making home barbecuing stress and anxiety free will result to a more quality family bonding time. Summing it all up, home cooked barbecue is great in many ways. Always remember that the best barbecue is mostly a product of patience and perfect fire-tending. For each part of the meat – the shoulder, ribs, brisket, etc., must be cooked in different length of time. Only the best and keenest personal observation will allow an individual to master the skill of cooking home-made barbecues. Not to mention the fact that you also need to be keen in choosing your barbecue equipment and wood chips in order to come up with great tasting barbecue. Weekend barbecue can be a source of family bonding time. Share the laughter and fun of cooking home-made barbecue with your friends and loved ones. It will not only allow you to indulge in its mouth-watering taste, but you will also get the chance to enjoy each other’s company. Lastly, it releases your inner cave man attitude which is always craving for adventure and the great outdoors. Ryan Rivera used to suffer from panic attacks for seven years. He now advocates healthy living as the best weapon against anxiety, panic and depression. You can read more of his articles at Calm Clinic. Once upon a time, smoking was used as a way to preserve meat’s freshness. In the years since the invention of the refrigerator, smoking meat has become a favorite past time of expert grillers and backyard barbeque enthusiasts alike. In short, smoking meat is the art of cooking your cut at a relatively low heat (usually between 200 and 250), using just the smoke from your fire source. Different types of meats call for different types of smoking, but when done right, smoking can turn even some of the worst slabs of meat into a tasty meal. The following are the five most common types of smoking today. Without question, smoking meat over a wood fire is the gold standard. Like the wheel, sometimes things last for thousands of years because they work. Wood smokers come in many shapes and sizes, but unless you are cooking for an army, the key thing to remember is that less is more. The biggest mistake first timers make is using too much wood and building too big of a fire. Remember, the smoke is what cooks and flavors the meat, not the fire! Cheating a little bit right off the bat, but if you are going to learn how to smoke meat, than you should be willing to at least try the classic way. That said, since a big part of the flavor from this style of cooking comes from the smoke itself, the type of wood you burn can make a huge difference. Most fruit and nut woods can burn without the smoke overpowering the meat flavor. Hickory, apple, and oak are great woods to get you started. While many barbeque lovers swear against gas smokers, the fact is they are a great, easy way to begin to learn the craft. With enough practice, you may even be able to start to replicate that wood smoke taste. A lot of practice. Convenience is the key to the electric smoker. Simply put, for those of you in an apartment or a place where an open flame is not allowed, an electric smoker offers an easy way to connect with your rugged outdoorsman. Guest blogger: Mark Lynch is a guest writer for Le Cordon Bleu culinary schools. Now we all know that barbeque, or BBQ as it is, is a big thing in America. But I am pretty sure a lot of people don’t realize how diverse of a tradition we have in this country. For some folks there may be knowledge of just a few of the different traditions, and I think that’s just a shame. So I’m taking this chance to highlight some of the various styles of barbeque we have. I’ve broken them down by state. This is often referred to as “Memphis-style” and focuses slow pit-cooked ribs and barbeque sandwiches. There are wet ribs (which are sauced) and dry ribs (where a rub is applied) and the sandwiches are made of chopped pork on a bun, and can be served with a variety of sauces depending on the joint you’re eating at, or whose back yard you’re in. This is another pork tradition, which sometimes even goes “whole hog” and lets none go to waste. Barbeque in this region can be coated with vinegar-based marinades that include loads of spices, or are sometimes drenched with ketchup or mustard-based sauces as they’re cooked. Some people call this “Low Country” style. Usually referred to as “Kansas City-style”, this tradition has spawned the biggest competitive barbequing organization in the nation. Fortunately, they aren’t to snobby, and every style of barbeque is judged at their competitions! The actual KC-style consists of, as you might imagine, a lot of emphasis on sauce served as a condiment, as well as the dry rub used on the meat. Speaking of meat, they tend to use just about everything they can get their hands on in KC style! Texas is big, and it has a lot of influence. 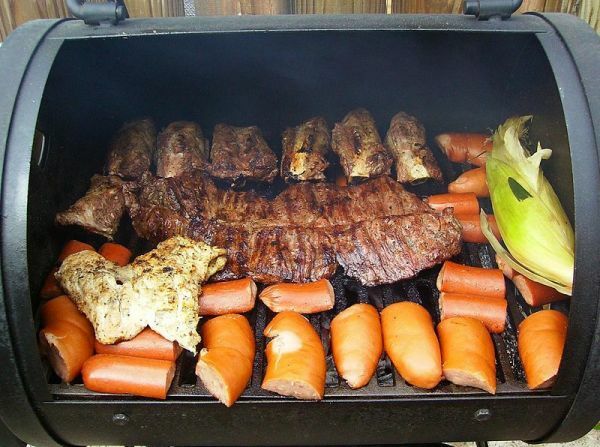 The variety of barbeque in Texas is impressive, and you can see a number of different meats used (though beef remains the signature Texas meat of course), as well as sauces, rubs, and more. The type of wood used in different parts of Texas also has a big influence on the taste. Mesquite, hickory, pecan, and oak all have their places. Down towards Mexico way there’s of course a lot of interesting influences, with barbacoa adding in a lot of goat and sheep, as well as using an underground oven. With a tradition of large pit barbeques and a beef base which arises from the days of cattlemen in the state, Californian barbeque also involves a lot of towed trailers which can be found at events across the state. Pork and chicken dominate the Virginian scene, with heavy influences from both the Carolinas and Tennessee meaning there’s a lot of vinegar involved, but also bourbon, and tomato-based sauces, and it tends to be quite smoky. In Virginia you can sometimes find game animals being barbequed as well, which is quite a treat. This one sure is a special part of America. The Polynesian roots of the native Hawaiians have given us one of the most fantastic experiences available in event barbeque. The luau is a whole evening of entertainment and food which features kalua pig, a whole swine cooked in an underground oven pit. If you ever go to Hawaii, this is not to be missed as it is absolutely unique among all American barbeque. So there you have it. 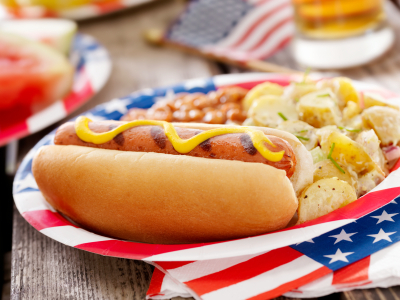 A great variety of barbeque traditions from all across the nation. If you’re passing through a region, try and make sure to sample some of the local flavor. You’re bound to find something worthwhile!